All of us who play the greatest game have, at one time or other, known the feeling of a special round, a beautiful golf course, a memorable day. We carry the images of that day with us, forever, and though they may fade over time, the feelings and emotions that we once experienced can be quickly recalled and relived. 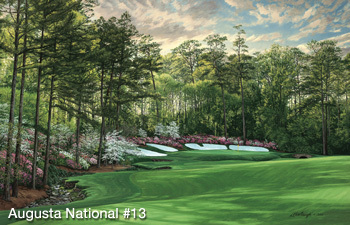 For the competitors at the highest level of the game, the playing fields reserved for the four Majors are the landscapes and backdrops of the best their sport has to offer. 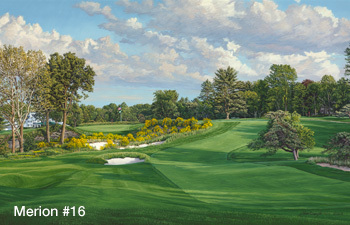 In “Green Glory: A Visual Tribute to the Courses of the Majors- Golf’s Renowned Venues” (Stonehouse Publishing), a stunning coffee-table book that combines the world-class talents of two passionate and award-winning golf artists, golf-landscape painter Linda Hartough and photographer Patrick Drickey, we are all given a chance to appreciate the Major courses, and to remember the events that make them special, as well as to soak in the history and traditions that add to their luster. Linda Hartough (who I profiled for the 2005 edition of On The Green Magazine) proves again that there is no one more adept with a brush and canvas and access to the world’s great courses than she is. 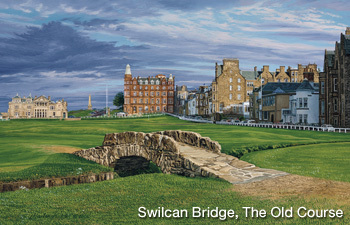 World-renowned and internationally honored, she is the only artist ever commissioned by the United States Golf Association and the Royal and Ancient Golf Club of St. Andrews to do the annual paintings and prints for the U.S. Open and British Open Championships, as well as being the recipient of Golf Digest’s prestigious “Lifetime Achievement Award” (though obviously still active and producing the highest quality of work in her field). Patrick Drickey is likewise at the top of his considerable game, a celebrated landscape and architecture photographer whose dream of capturing the soul of golf’s courses and performers, on film, led to a career as one of the world’s great golf photographers, and whose pioneering work with panoramic images set the game’s standard (Drickey is also, thankfully, the founder of Stonehouse Publishing, publisher of ‘Green Glory’). When you combine the richness and detail of Hartough’s landscapes and Drickey’s photographic images in one magnificent book, the result is, fittingly, a truly major achievement. As you turn its pages and go through the venues one by one, courses you’ve seen or played come to life in exquisite clarity, and courses you’ve not had the chance to yet see will become a dream-like goal. Such is the brilliance of each contributor’s work that I found myself sometimes wondering if the page before me contained a Hartough painting or a Drickey photograph, such is the rich, impressionist quality of each one’s work. Add to the beauty of the images the information in the descriptive text for each course/hole that provides the historical context of each one (most text by M.E. Mortensen, all edited by Sally J. Sportsman), and ‘Green Glory’ is a timeless source of joy, both in imagery and in information, for anyone who loves the game. Sit down with “Green Glory”, turn its beautiful pages, and I guarantee that you’ll feel the same way.